STRUM 67, STRUM 76, STRUM 83, STRUM 84, STRUM 85, STRUM 98, STRUM 95, STRUM 96, STRUM100, STRUM102, STRUM103, STRUM100, STRUM105, STRUM107, STRUM 110, LICK 67, LICK 76, LICK 83, LICK 84, LICK 85, PIK 125, SK 114. A new approach to creating guitar files in MIDI, using multi-timbral recording techniques with each string set to its own MIDI channel. 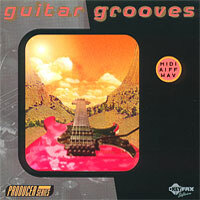 Comprising more than 350 guitar files recorded by a session supremo, the material was gathered and post-produced according to both tempo and rhythm sensibility. Played by JJ Belle, a uniquely gifted guitarist who played on some of the greatest recordings of the 1990s (Slave To The Rhythm, Faith...) who sadly succumbed to cancer in 2004, aged 49.